It was the end of a chilly, rainy day. I had spent a long morning doing field visits on North Shore of Massachusetts. Okay, I was only mildly lost and this was no life-or-death situation, but I still got that all-to-familiar wave of anxiety that comes with realizing you have no idea where you are. I was supposed to be in Willowdale State Forest but something didn't seem right... was I supposed to cross the street? Was the lot I parked in even on Topsfield St.? I had made so many stops to other locations that the back roads of small-town Massachusetts all started to look the same. Getting lost was precisely what I was trying to remedy. 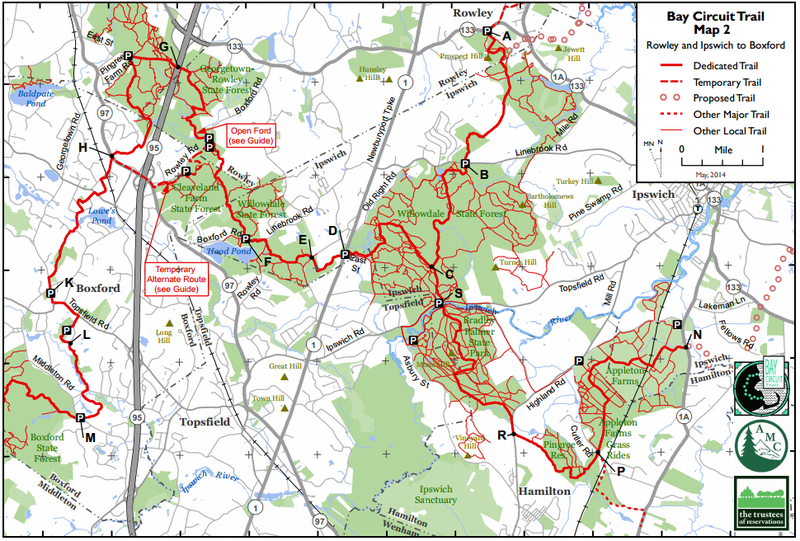 AMC received a grant from Cell Signaling Technology to fund improved signage on the Bay Circuit Trail in seven North Shore towns. My role was to work with local volunteers and members of the Bay Circuit Trails Committee to identify places where traditional wooden routed trail signs would be useful. This project will serve as a "test" to see where wooden trail intersection signs work (or do not work) for the urban/suburban landscape of the BCT. So, I got out my marked up map and put a fat red circle around Point S... or was Point S really where I thought it was? I am no stranger to using static maps and I consider myself someone with a good sense of direction. The photo above is of the map I used most frequently during my time as a Teen Trail Crew Leader and AMC's Noble View Outdoor Center last summer (we also did a major signage overhaul there). My BCT map was starting to look similar to the one above as I marked all the potential places that could use signs. Eventually we pared it down to strike a balance of having useful navigational information while not overloading hikers with too many signs. These new signs are being made by AMC's sign shop this winter and will be installed by volunteers in the spring/summer '15. I'm happy to say "Point S" stayed on the list, so users will be able to park in the lot and know whether they are walking into Bradley-Palmer State Park or Willowdale State Forest. I also mentioned the static maps that are at times difficult to use, especially in the field; those are also slated for an upgrade in 2015. No matter what, always remember to follow the first principle of Leave No Trace: plan ahead and prepare. 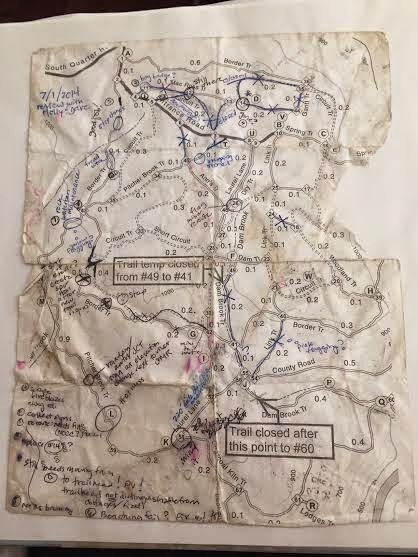 It's important to have solid orienteering skills and not rely on your phone as a GPS, but nothing beats planning ahead and studying maps before you hit the trail. Keep a look out for the new trail signs on the northern section of the BCT during the spring/summer, and happy trails!